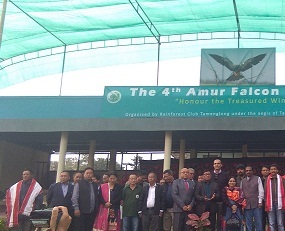 With the theme ‘Honour the Treasured Wings,’ the fourth edition of Amur Falcon Festival was held under the aegis of Rainforest Club Tamenglong in collaboration with Tamenglong Forest Division at Tamenglong town, 150 km west of Imphal in Manipur on Monday. Local MLA Samuel Jendai graced the festival as the chief guest. Principal Chief Conservator of Forest (PCCF) K Angami of Forest Department, Government of Manipur, also attended as the functional president. ADC members including Ramningle Pame, Charles Liangdiyang, G Apoukhui and district-level officers attended the programme. In his speech, local MLA Samuel Jendai urged all to explore the beauty of Amur Falcon instead of killing the small raptor of the falcon family which has unique characteristics. He expressed his gratitude and heaped lavish praise on the scientists of Wildlife Institute of India, Dehradun, for their effort to conserve the migratory bird Amur Falcon ‘Akhuaipuina’ (in Rongmei dialect). Stating that satellite tagging of Amur Falcon in the names of ‘Tamenglong’ (female) and ‘Manipur’ (male) will be well-known in the global world. Dr Suresh Kumar of Wildlife Institute of India released two migratory birds – Amur Falcon – one male and one female after their satellite tagging. MLA Samuel Jendai presented citation certificates to five villages including Chiuluan, Bamgaijang, Phalong (Bhalok) Ajuram and Sonpram for their efforts to preserve and protect natural resources including Amur Falcon. In his presidential address, PCCF K Angami mentioned that Phalong (Bhalok) Village has been declared as Amur Falcon Village and expressed the desire to name Tamenglong district as ‘Amur Falcon District’ as migratory bird come and rest in many villages of the district. For this, he also called upon the Forest Department to take necessary steps so that the same can be approved at the earliest.